An artificial intelligence recently released a death metal album created entirely by algorithms. This isn’t the first time someone’s programmed a machine to create new music. But this time is different. Because it’s actually quite good. And that’s pretty spooky. DADABOTS’ debut album was created, musically, by a neural-network studying the work of a human metal band called Krallice. Basically the AI listened to all the sounds it was fed and started trying to guess what more of the same would sound like it. It did this a few million times before it was able to create its own original work. The album’s name, and the titles of the songs, were conceived by another AI. And the artwork for the album cover was created by yet another algorithm. In other words, a band of robots just dropped an independent metal album. The record’s five tracks incorporate death metal’s traditional melancholy intros, wailing guitars – and let me just stop myself right there. We have a new problem. How do you describe ‘music’ created by a machine? There are no guitars, though on some of the tracks you’ll hear something very much like a guitar solo. And that thumping, bumping drum sound you hear? Not drums. It’s all just noise. Early in its training, the kinds of sounds it produces are very noisy and grotesque and textural. As it improves its training, you start hearing elements of the original music it was trained on come through more and more. This album is part of a submission to NIPS 2017 Workshop for Machine Learning, Creativity and Design: “Generating Black Metal and Math Rock”. Even though there’s no instruments and the machine playing it doesn’t care about the sounds it produces – it still sounds pretty good. Call me crazy but “Wisdom Trippin’” by DADABOTS is a decent track with some interesting progressions. The strangest thing about CoT is that it reminds me of a raw live album, the sound could be from VHS footage captured next to a mosh pit at CBGBs in the 80s. And the music is good enough to fool at least a few of your friends with. Tell people this is some metal band you heard when you backpacked through Europe and see if anyone guesses it’s made by AI. 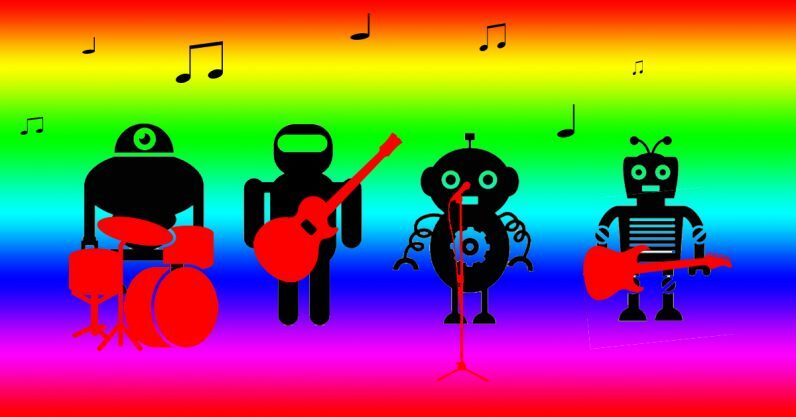 If you’re wondering whether the robots who made the music are being paid, the answer is: probably not. The entire album is available for free right here. It’s definitely worth listening to. And it’s good to know that if the robots rise up and destroy us all, metal won’t die with us. Black Metal Math Rock is the future of music.